It’s Labor Day already. Yikes! I read somewhere last Friday that Christmas was only 16 weeks away. The way time flies, 16 weeks is like a nano second. Has anyone started Christmas shopping yet? I always say I’m going to start early and get it done and then that kind of never happens. What about you? 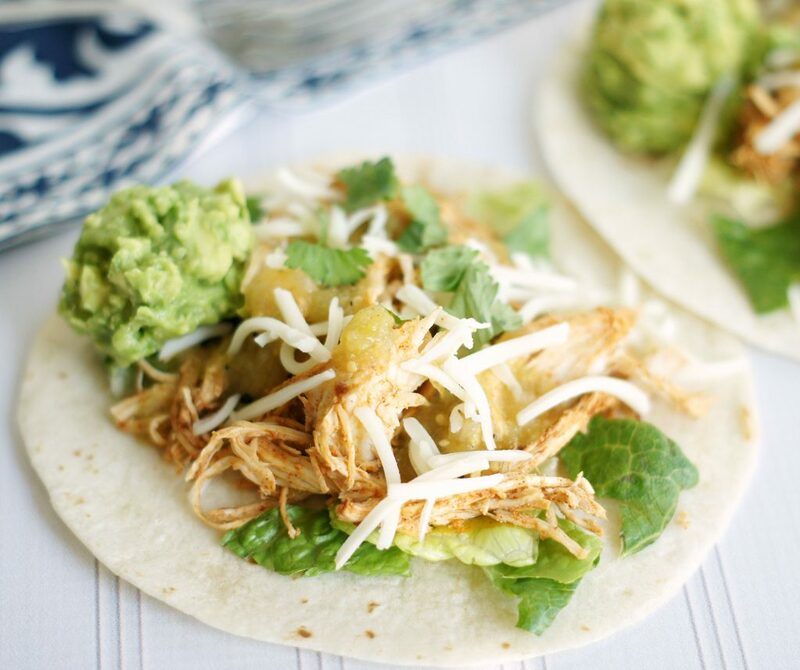 Well for now, let’s not worry about Christmas and let’s just talk about these delicious Slow Cooker Chicken Tacos. These tacos scored some pretty big points at our house the other night. We are kind of huge Mexican Food lovers at our house. In fact, Parker would eat Tacos every night of the week if I’d make them that often. When we eat out, he always wants Taco Bell (really?)! Anway, this chicken is simple, full of flavor and so, so versatile. Use it for tacos, burritos, tostadas or enchiladas. Throw the chicken in your slow cooker, cover it with some chicken broth and several hours later your dinner is about done. Just shred your chicken, throw in some green chilies and chili powder and you’ve got dinner ready. Easy, peasy! Garnish with any toppings that your little heart desires! 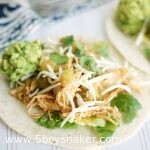 This chicken is so simple to throw together and perfect to use for tacos, burritos or enchiladas. It is a great weeknight go-to dinner. Place chicken breasts and broth in slow cooker. Cook on low 5-6 hours or high 3-4 hours. When ready to serve, remove chicken from slow cooker and shred. Drain liquid from slow cooker, reserving about 1 cup of it. Return chicken to slow cooker and stir in chili powder and chopped green chiles. Add some of the reserved liquid just to moisten chicken. 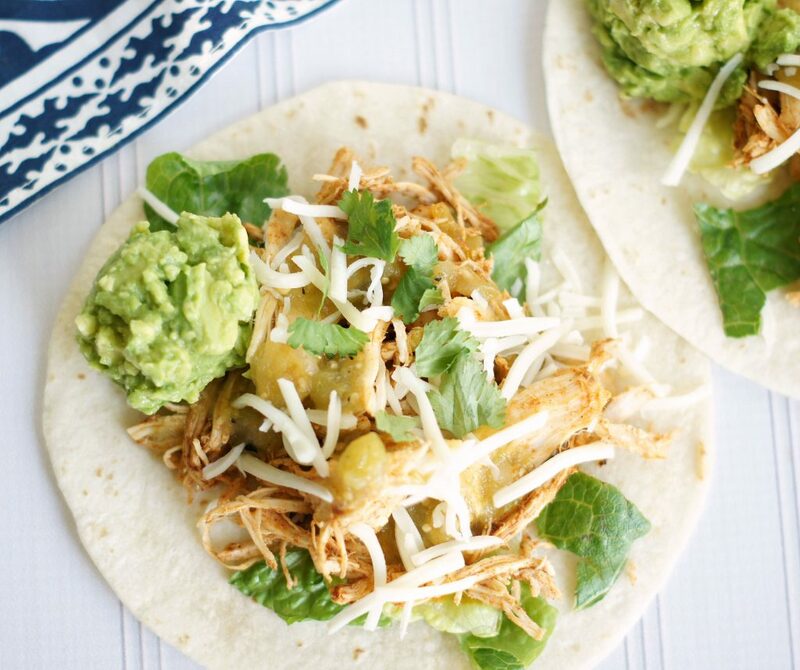 Assemble tacos by layering chicken, lettuce, salsa, cheese, guacamole or any toppings of your choice. This chicken is so flavorful and delicious. Make sure you reserve some of the liquid after the chicken is cooked because it does tend to dry out slightly if you don't add a little liquid. how many does the chicken taco feed? It easily feeds 12, if not more. There are six of us at home and 3 out of the six had seconds and there was still plenty of chicken left, enough to use it for a second night for dinner.